I chose Casa Beat as the very first record in the RiL series because it sums up everything I want to the series to be about. I am fascinated, to the point of obsession, with the 'mysteries of house'. Most of my favourite house music records were written by anonymous producers. At first there were no superstar DJs, just a simple record label and a black wax disc. So many of the creators of the music have long since left the scene, or died, or found other avenues in life. I love finding out their stories and even tracking them down personally if I can. I want to bring to your attention some of the records that have slipped through the net, were missed or overdue closer investigation. I am also interested in using RiL as a resource for collectors interested in the era I have been DJing, especially from my long running residency at back to basics in Leeds, which I begun in November 1991. 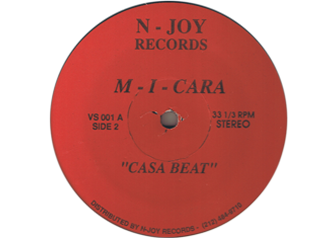 Casa Beat actually came out the year before in 1990 when I heard DJ Harvey spin it at a Tonka party. It was a moment of total euphoria for me on the dancefloor of a warehouse at an illegal free party. It was a total moment of clarity for me that I still remember like it was yesterday. My DJ partner at back to basics Huggy found a copy, which we fought over for 20 years, until I finally gave it back to him in 2012. It is the only record made under the name M-I-Cara, produced by an Italian called Sanny X. It came out on N-Joy records and gives an old New York phone number on the label. Musically it is an ecstatic, blissed out journey that never fails to give make the hairs on my arm stand up. Mint copies go for £70 plus. It was the first record I went to license when compiling the basic vision project celebrating 25 years of the club.